In its 20 years of existence, JESUS COMPLEX has presented three albums to this ill world – «I Woke Up Dead», «Greetings From The Dead» and the latest «Live A Little - Die A Little». Damon Fries stays true to himself and is still the same gloomy electro-industrial, aggro industrial, darkwave and EBM with many subgenres style elements mixed together. «Live A Little - Die A Little» is an ominous sermon with tragedy, grotesque, vices and repentance. This is a story about how the living envy the dead and vice versa. 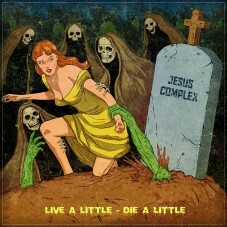 If the album «Live A Little - Die A Little» would have been a film, this horror would surely be made by Hammer studio. «Live A Little - Die A Little» LP is truly a triumph and celebration for all connoisseurs of horror atmosphere and fans of such music sound.